Hidden Canyon is a beautifully narrow and deep "hanging canyon" tucked away above the main canyon east of the Great White Throne. 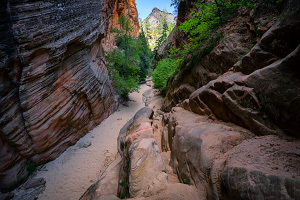 The manufactured trail climbs up the east side of the main canyon, crosses a few ravines and ends at the mouth of Hidden Canyon, giving hikers access to explore up the canyon as far as they can. This hike is fairly strenuous with an elevation gain over 1000 feet, several exposed sections, and plenty of rock scrambling in Hidden Canyon. It may take anywhere between 3 to 6 hours depending on how much you explore. SPRING 2019 NOTICE: This trail is currently closed due to a rockfall that has blocked the Observation Point Trail/East Rim Trail near the junction with the Hidden Canyon Trail along with a second rockfall along the Hidden Canyon Trail. This hike may be closed for the foreseeable future. Rating: Fairly strenuous day hike with some exposed sections and optional scrambling. Elevation Change: 1000-ft elevation gain to the mouth of Hidden Canyon. Seasons: Year-round. Spring and fall are most pleasant; summer can be very hot. The approach is typically blocked by snow in winter. The trail to Hidden Canyon starts at the Weeping Rock Trailhead, the 7th stop on the Zion Canyon Shuttle, the same trailhead as for the Observation Point Trail and the East Rim Trail up to Cable Mountain, Deertrap Mountain, and the East Entrance Trailhead. Hike up the paved trail that zig-zags its way up the east side of the main canyon. Take your time; if you're not acclimated to uphill hiking, this could be quite strenuous. 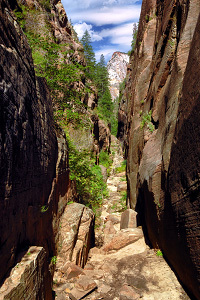 Soon enough you will come to the junction of the Hidden Canyon Trail; now it's time to choose the path less traveled! The Hidden Canyon spur trail starts with a few uphill sandy switchbacks to make its way to the top of a minor saddle. (There is an unofficial viewpoint with a short trail of use to get to the tip of the saddle; please be careful as this area is very exposed!) The trail then follows the canyon wall and with the help of a few chains, it descends into a little shaded valley. A tall set of stone steps take us to the final section of trail: a short exposed ledge section that was chiseled out of the sandstone walls. While not technically difficult, this section could be quite intimidating to those with a fear of heights. Take it slow and hold onto the chains! Soon enough, we reach the mouth of Hidden Canyon! Be careful crossing over the streambed; the large potholes usually have water in them. This is the end of the official trail, but you can hike up the canyon for another mile or so. 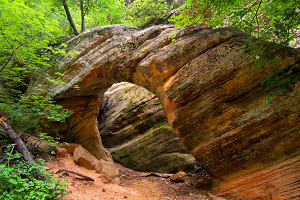 You will encounter enticing dark overgrown sections, sandy open sections, moss-covered walls, and even a small free-standing arch. There are plenty of boulder-scrambling obstacles to contend with; they range from easy to more difficult and exposed. Climbing/scrambling experience definitely helps, but go only as far as you feel comfortable with. Remember: it's often harder to get back down. Eventually you will come to an impassible obstacle (like a 30-foot tall overhanging wall) and it will be time to turn around and head back. Note: Technical climbers can and have climbed their way out of Hidden Canyon, but this isn't something that most hikers can or should do. This is one of my all-time favorite hikes in Zion; I highly recommend it! I did this hike several times with my parents when I was a child, and each time, we made it just a little bit further into the canyon. This is the hike that got me obsessed with exploring the backcountry of Zion. Admittedly, those looking for a spectacular viewpoint (like Observation Point or Angels Landing) might not find this hike to be very appealing. Hidden Canyon can also be descended from a direct start off of the east plateau by Deertrap Canyon. 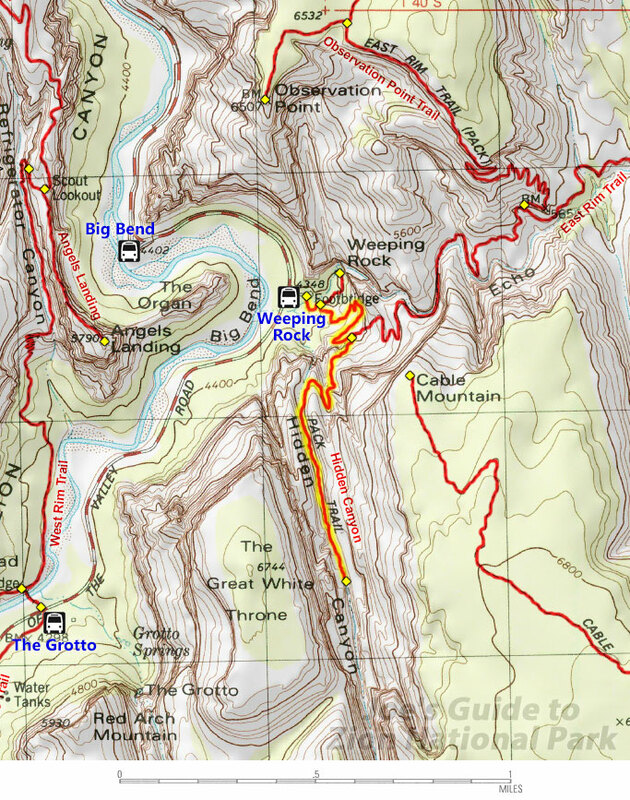 WARNING: This is a technical canyoneering route involving several 100ft. rappels and exposed downclimbs; do not attempt without being properly prepared! Tom Jones has a good description of this route on his canyoneering website. Like all technical canyons in Zion, you will need to get a permit from the Visitor Center for the top-down route.